The relentless process of regulatory reform is getting bogged down in its own complexity. But before banks can draw a line in the sand and move on they need to prove they can be trusted on a longer leash – and stop treating every reform like it was General Custer’s last stand. 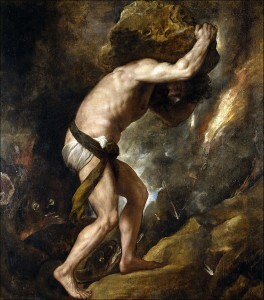 If Sisyphus were around today he wouldn’t be pushing a boulder up a hill in perpetuity. Instead, he would probably be the chief executive or chairman of a large international bank, damned for all eternity to the futile task of trying to keep up with a never-ending flow of regulatory reform: responding to relentless consultation papers on new regulations that will never be implemented, conducting continuous stress tests that are impossible to pass, and hiring infinite numbers of compliance staff whose work will never be done. Douglas Flint, chairman of HSBC and unofficial spokesman for the global banking industry in his capacity as chairman of the Institute of International Finance, touched on this Sisyphean task when he broke cover recently to speak up about the growing burden of fragmented and inconsistent reforms. Flint described the ‘unprecedented’ demands being placed on the bank’s staff and systems from the ‘cumulative workload…from a regulatory reform programme that is unfortunately increasingly fragmented, often extra-territorial, still evolving and still adding definition’. While he stressed that HSBC was fully ‘committed and resourced’ to meet these demands, he suggested it might be time to park any new regulatory initiatives and maybe pause for breath in implementing existing ones. It is hardly a revelation that senior bankers think there is too much regulation. But it is hard to disagree with the thrust of Flint’s analysis that the increasingly complex and overlapping process of international regulatory reform risks not only failing to make the financial system safer, but could also be undermining already fragile economic growth. The banks’ concerns deserve a hearing, but not before they have considered two important questions. First, how much of this problem they have brought upon themselves through the way in which they have reacted to the reform process? And second, how can the banks now work with regulators and policymakers to help sort out this mess? There is little question that the reform process is getting bogged down in its own complexity. Broad international agreement over the general thrust of reform at the G20 five years ago has dissolved into an unwieldy tangle of competing national politics and vested interests. The sheer volume of reform is eye-watering. There are more than 40 live dossiers on financial reform at a European Union level, and the Financial Stability Board has more than 70 different working groups looking at different aspects of reform. In the UK, the Financial Conduct Authority and Prudential Regulation Authority have issued 47 consultation papers between them in the past year. The consultation paper for Mifid II, the European Union’s blueprint for securities markets reforms, was 800 pages long and attracted 550 responses. This volume is compounded by different countries and regulatory bodies pulling in different directions, pursuing competing priorities, and often applying their own finishing touches. National regulators are torn between transposing top-down international regulations into their own rulebooks and applying bottom-up domestic reforms, such as the Swiss finish on bank capital, the Vickers reforms and unusually long bonus deferrals in the UK, or potential new leverage requirements in the US. Different regulators insist on using their own methodology and applying their own deadlines irrespective of other commitments creating unnecessary pressures and duplication. There is also little question that a lot of the reforms are of questionable value. When US regulators this month rejected the ‘living wills’ submitted by 11 big banks, they highlighted how much time had been wasted over the past few years in pretending that the process of winding down an organisation as complex as Citi or JP Morgan Chase over a weekend could done with a manual a few thousand pages long that is out of date almost as soon as it has been printed. It’s not just the banks that are suffering. The layering of new regulations on top of each is placing an intolerable burden on regulators themselves, potentially creating a vicious circle of too much regulation having to be implemented by regulators who lack the ability, budget or bandwidth to handle it. The more regulation is added, the worse it becomes. There are lots of reasons why the process of regulatory reform has become so complex. Most obviously, global banking is a complex business. HSBC, for example, employs more than 250,000 employees in 74 different markets and has a balance sheet of $2.75 trillion. It is hardly surprising that policymakers in lots of the countries in which HSBC operates want to impose higher costs on this sort of complexity. A lot of the blame for the confusion lies with politicians for their populism, posturing and point-scoring. It would have been far more elegant and effective if individual national governments didn’t insist on adding unilateral reforms tailored to their own market on top of international multilateral agreements. Or if democratically-elected representatives in Brussels didn’t insist on coming up with awkward reforms such as bonus caps that didn’t fit into the original blueprint. But politics is a messy business. And the regulatory reform process has become self-perpetuating. An industry of regulation has been created and a lot of policymakers and regulators – particularly central banks – have reclaimed lots of power that they will be unwilling to give up anytime soon. But a large part of the blame rests squarely with the banks themselves. Sensible and successful reform requires trust and engagement from both sides, and over the past few years banks have scored poorly on both counts. They have conspicuously failed to rebuild trust with policymakers. The dripfeed of one scandal after another and the failure to address the disconnect between performance and bonuses have undermined the industry’s attempts – however genuine – to prove that it has changed for the better. Too often, banks have given the impression that they see new regulations as a challenge to be overcome, instead of rules to be followed – for example in dreaming up ‘role-based allowances’ to bypass the EU bonus cap. This creates a vicious circle of regulatory arbitrage that Professor John Kay recently wrote about so eloquently. Forget the spirit of the law: how far can they stretch the letter? By pushing back so fiercely on some of the big levers that policymakers could pull to fast-track change – such as a significant increase in leverage ratios or the structural separation of investment banks from their commercial banking parents – banks have encouraged a more incremental and micro- approach to reform that they now find so intrusive. At the same time, they have treated every proposed reform as though it were General Custer’s last stand, a negotiating tactic that has raised temperatures and hardened attitudes on both sides. Occasionally the banks’ efforts to make their case have spilled over into deliberate obfuscation and outright misinformation. Sometimes it is remarkable that there are any bankers left in Europe to complain about the burden of regulation that is supposed to have forced them and their clients to pack up and leave long ago. Banks would no doubt like to draw a line in the sand and move on, but it would be unrealistic of them to expect regulators and policymakers to agree to a temporary ceasefire let alone a bonfire of existing regulations. At best, banks can hope for international agreement on an end to any new substantive reform initiatives, perhaps at the G20 this year in Brisbane. To encourage this, banks could show willing by lending their weight to growing calls for a new global body to police the harmonisation and implementation of existing regulatory reform. But ultimately, if the banks want the burden of regulation and pace of reform to ease, it is up to them to prove that they can be trusted on a longer leash, to stop treating reform like a competition, to make a more positive and constructive case for what they do – and to accept that it might make more sense to judiciously lose a few battles in order to have a better chance of winning the war. And the alternative? Senior bankers may recall that the story of Sisyphus doesn’t end well. In fact, it doesn’t end at all.